Welcome to ACCUPLACER Practice Test. The best website for free ACCUPLACER practice questions. All of our free practice tests are completely interactive with instant computerized scoring. Answers are also provided, along with detailed explanations. Get started with your ACCUPLACER test prep right now! The ACCUPLACER Test is a college placement test that is administered by the College Board. It is used by over 1,500 institutions as part of the enrollment process. The purpose of the test is to identify strengths as well as weaknesses in a variety of subject areas. Colleges and technical schools will use the results of this test, along with your goals and academic background, to place you in courses that are appropriate for you. All of the questions on the ACCUPLACER Test are multiple choice, except for the WritePlacer essay question. The test is computer-adaptive, which means that the questions change based on your skill level. Your response to each question determines the difficulty of the next question. This means that if you are answering a lot of questions correctly, you will begin getting harder questions. With this type of test it’s very important to think about each question carefully before selecting your answer. There is no time limit on any of the tests. The Sentence Skills questions are designed to measure your understanding of sentence structure. The Reading Comprehension questions test your ability to understand what you read, to make inferences, and to identify the main idea in a passage. There are 3 ACCUPLACER math tests: Arithmetic, Elementary Algebra, and College-Level math. You definitely want to review these topics to make sure you remember how to solve these problems. As you work through each ACCUPLACER math practice test, pay attention to the questions you miss and make sure you spend extra time studying these topics. The WritePlacer written essay measures your ability to write effectively. You will be given an essay prompt, and you will need to write a multiple-paragraph essay of about 300–600 words. You will be graded on these 5 characteristics: Focus, Organization, Development & Support, Sentence Structure, and Mechanical Conventions. Your ACCUPLACER score can definitely benefit from test prep. 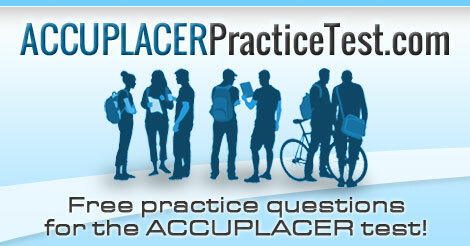 Start your review right now with our free ACCUPLACER practice test. Why Should You Prepare for the Accuplacer Test? The purpose of the Accuplacer Placement Test is to assess your grasp of the math and language concepts you learned over the course of your four years in high school. The results of your placement exam will indicate what level courses you will be required to take. If you receive a low score, you may find yourself in remedial math or English, relearning materials you covered in high school. Preparing with TestPrep-Online’s ACCUPLACER Practice Pack: Premium will save you the time and money that you would otherwise spend on remedial level classes. This is a great option if you simply need a refresher to review the material and understand the types of questions you will likely face on the actual test.